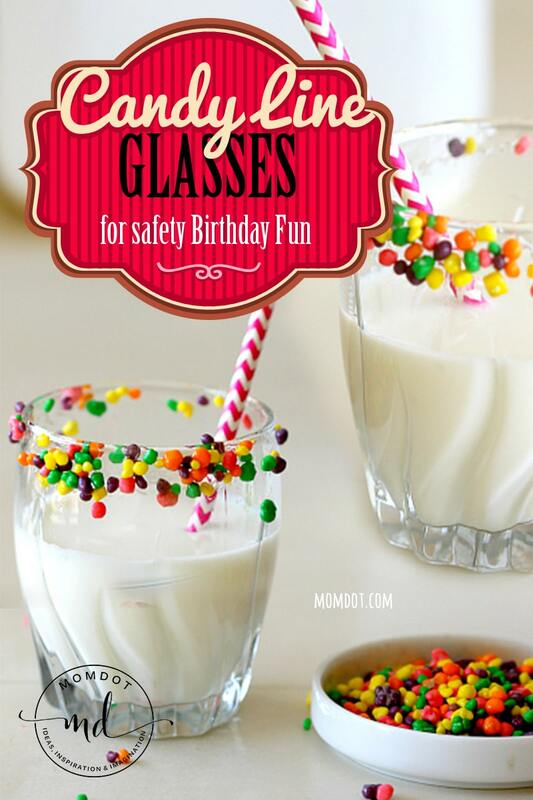 Home » Recipes » Desserts » Candy Line your Glass for Special Birthday Fun! 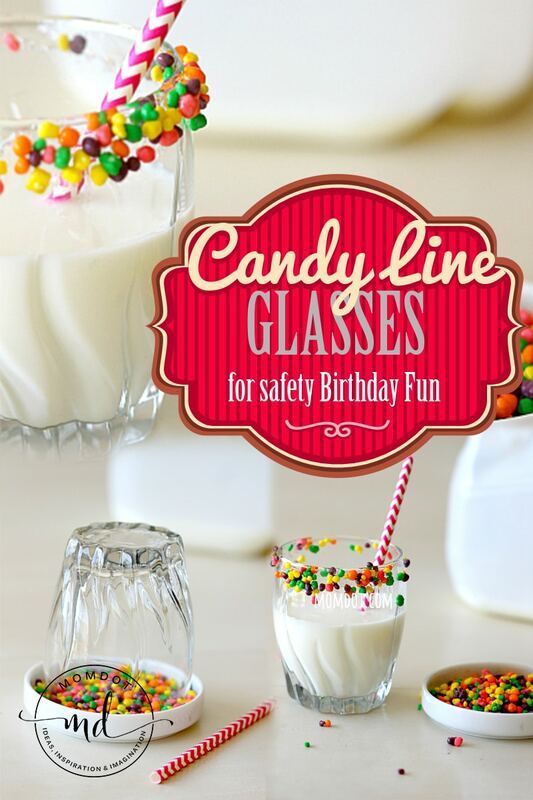 Candy Line your Glass for Special Birthday Fun! Candy Line your Glass for Special Birthday Fun! Easy to do, candy line the rims of your glasses in small candies to create an extra special table setting for a party. As a blogger, I often see really cool ideas out there in the blogosphere and one of those has been drink cups lined with sugar around alcoholic or holiday drinks. But I got to thinking that this could be taken a step further to include some fun candies for a special birthday treat or a slumber party and what could I do to make it a bit more “kid” friendly. 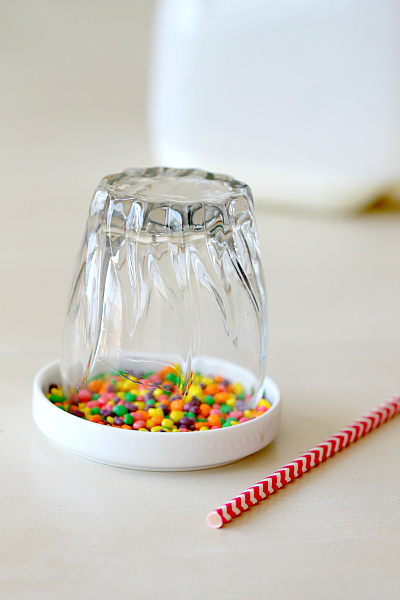 The challenge with lining a cup with candy is that candy is heavy, plain and simple. It slides… so the lining a cup with water and dipping into colored sugar theory pretty much failed right out the gate. If the candy stuck at all, it slide down and fast. My little glass was peppered with pink and green lines almost immediately. After scaling my pantry for a few minutes, I instead tried some Karo syrup. It’s clear, it’s heavier and it has more of a glue affect. With a little patience that is. If you line the cup with Karo (I simply dipped my finger in the cap and “painted” the glass rim) and then dip your glass in light weight candies like Nerds, it sticks pretty well. You can also do this with melting chocolate if you want it to dry and stay perfect! There are some tricks to it though if you do want to try this for a special day or birthday treat. 1) Line the glass with Karo and dip. Then let SIT for 5 minutes. You are using syrup after all and it needs a few minutes to DRY. 2) If you do not let it dry, it will do this….some candy falls off right away, some slides slowly down the glass and some fall INTO the drink. It works, but it doesn’t work as well as it could. 3) However, if you wait about 5 minutes with the glass still upside down, it gives it a chance to “dry” and sticks better resulting in a darling special birthday drink. You can test this out with different candies as long as they are not too heavy or as long as you give it a chance to “dry”. What an awesome idea. Never thought of syrup! This is too cute!! I repinned this the other day and didn’t realize it was you who came up with it. Very fun! what a cute idea, this would be fun for a kids party! That is such a neat idea..I’ll have to try this out with my kids. I know they’ll enjoy it..thanks for sharing. What a fun idea. My son turns 6 this month and I think I might do something like this, he would love it! I’m going to have to try this tomorrow. It’s my daughters b-day. Such a cute idea! I know that both kids and adults would love this! CUTE!! Such a smart idea! This gives me ideas…how about coconut milk with toasted coconut on the rim? Yum! You were pretty clever to think of Karo Syrup. What a great idea!! Such a good point about letting it dry for several minutes! I didn’t think about that. It’s super cute too! How fun! It reminds me of funfetti cupcakes. This would be awesome on a cake-flavored milkshake! This is a totally adorable idea! My kids would love this! Really cute! I’ll have to keep this in mind for a special occasion. That is so cute! I have tried the Karo syrup method and it does work for all kinds of stuff. super super cute!! i love it!! That’s a good idea – and you never find good ideas unless you test the limits! I’m definitely going to try some of my kids favorite lighter candies for special cousin gatherings. They love it when I set areas up just for them. For the adult non alcoholic bevvies I’m thinking of trying shredded coconut (letting it dry long enough)! This is adorable. I think I will use it for my daughter’s birthday party in the next few weeks. This is a super cool birthday treat! Chocolate and milk go hand in hand with kids and adults a like! My kids would call me cool if I did this. I think I will for Zoe’s birthday this spring!